733 pages of the third volume of "United States Army and Navy Journal and Gazette of the Regular and Volunteer Forces." This set contains 733 pages composed of 42 issues (668 pages). The 42 issues include issue Number 1 August 26, 1865 to Number 21 January 13, 1866, Number 23 January 27, 1866 to Number 27 February 24, 1866, Number 30 March 17, 1866 to Number 41 June 2, 1866, and Number 45 June 30, 1866 to Number 48 July 21, 1866. Also included are 65 pages from incomplete issues dating from January 22 1866, June 9 to June 23 1866, and July 28 to August 18, 1866. In the first months after the Civil War, the Army Navy Journal covered post war issues and looked back at some of the episodes of the war. Subjects covered included the reduction and transformation of the Union Army, The last POW exchanges, the construction of cemeteries and monuments, civil unrest, and pardons. 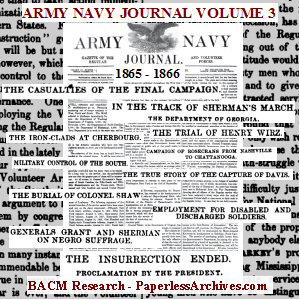 In addition to Civil War subjects the Army Navy Journal covered current military topics and news of conflicts from round the world. It chronicled current military information with stories about court martials, listings of obituaries, official dispatches from the War Department, appointments, list of AWOLs, foreign military matters, editorials and advertisements. The Journal included reprints of articles from Southern newspapers including the Greensboro Journal, Richmond Dispatch, Richmond Enquirer, Richmond Sentinel and Atlanta Constitutionist. Why Fort Sumter was not Reinforced? What are the Texas Troops Saying? Was General Gillmore's Campaign on Morris Island a Failure? Captain Henry Wirz was the superintendent of Camp Sumter, the Confederate prison at Andersonville, Georgia. Out of the 49,485 Union POWs held at Camp Sumter, also known as Andersonville Prison, 12,913 died. The causes of death were mainly starvation, diarrhea, and disease. Wirz's trial began on August 23, and ended on October 24, 1865. Wirz was hanged at the Old Capitol Prison on November 10, 1865. Establishment of the Bureau of Refugees, Freedmen, and Abandoned Lands, most commonly referred to as the Freedmen's Bureau, it was an agency within the United States Department of War. In April 1866, President Andrew Johnson declared that the insurrection in all the Confederate states had ended. In August of 1863, the civilian steamer Sea King was launched at Glasgow, Scotland. The Confederate Navy secretly bought the ship and sailed it to the Portuguese island Madeira and refitted it as a warship. The Confederate Navy commissioned the ship as the CSS Shenandoah on October 19, 1864. According to John Baldwin, author of "Last Flag Down: The Epic Journey of the Last Confederate Warship," during its 12 months of raiding, the Shenandoah captured or sank thirty-eight Union merchant vessels. The Shenandoah fired the last shot of the Civil War, at a whaler off the Alaska Peninsula along the Aleutian Islands. After the war officially ended, the Shenandoah from June 22 to June 28 1865 captured or sank 24 whaling ships. The ship than headed for San Francisco. On August 2, 1865 while en route to San Francisco, the ship's captain learned from the captain of a British ship that the rumors that the war had ended were true. Fearing the crew of the ship would be hanged as pirates, the captain sailed the Shenandoah 9,000 miles to Liverpool England to surrender to British authorities. Includes an index of subjects found in Volume 3 created by the publishers of the United States Army and Navy Journal and Gazette of the Regular and Volunteer Forces.